"Really, I liked hotel, location and price." Have a question for Cedran Hotel? "Simple and pleasant room, good beds and bathroom, quiet to s..."
Be treated like family at Cedran Hotel and leave feeling the warmth of Andalusian hospitality and culture. The hotel is located in Granada’s historic center, 500 meters from the Cathedral and 900 meters from the Alhambra. 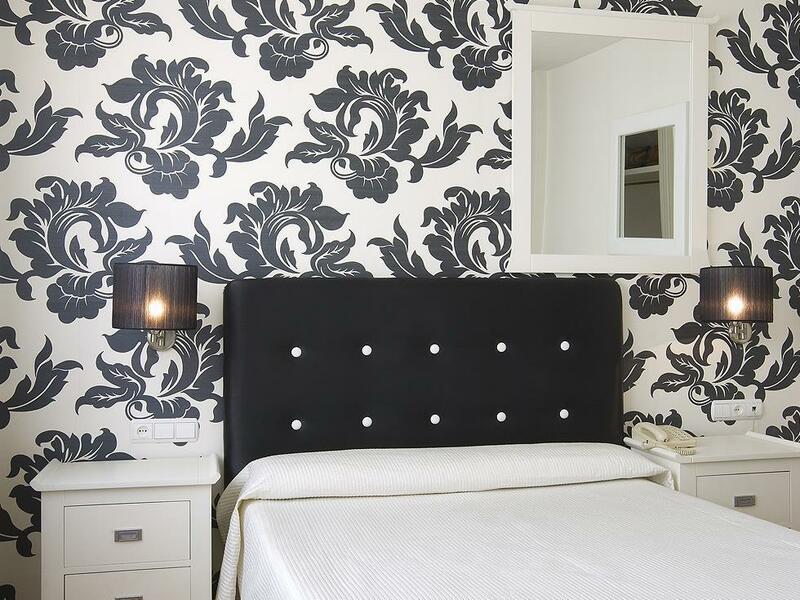 Cedran Hotel offers 18 quiet and quaint air-conditioned guest rooms located on four floors. Each guestroom extends to a bathroom and includes satellite TV, wireless internet access, direct-dial telephone, and safe. The shadows of the Alhambra, an ancient palace and fortress situated on a hilly terrace which was built as the residence of the Muslim kings of Granada, looms over the hotel’s property, making Cedran Hotel an ideal location from which to visit the palace, its museum, and the park surrounding it. "Cedran in Granada is a comfortable, fine located hotel for a..."
The hotel is located at a quiet lane, next to the main street, where you can take bus to downtown or main attractions. The cathedral is in the pace scope. Compared with similar level hotels, the price is good for 27 euro/night (February) . At first we planned one night stand in Cedran hotel in Granada, but later we desided to stay for two nights. That is because I had two bookings at the same place, and now have to write feedback two times. Really, I liked hotel, location and price. It was a very good choice! Cedran in Granada is a comfortable, fine located hotel for a low price. Simple and pleasant room, good beds and bathroom, quiet to sleep. Helpful stuff 24h. Historical place, beautiful architecture, dynamic city life. We liked Cedran. Nice stay. Consider walking distance near within 30 minutes to the viewpoint, AlBazyin and AlHambra. We just walk towards AlHambra, passing throung narrow lane as a lot to be see at the old quarters. The location is great as it only a walking distance to the city centre.the wifi only works at the lobby and we have to sit at the lobby to get the connection.the room is a little bit small. 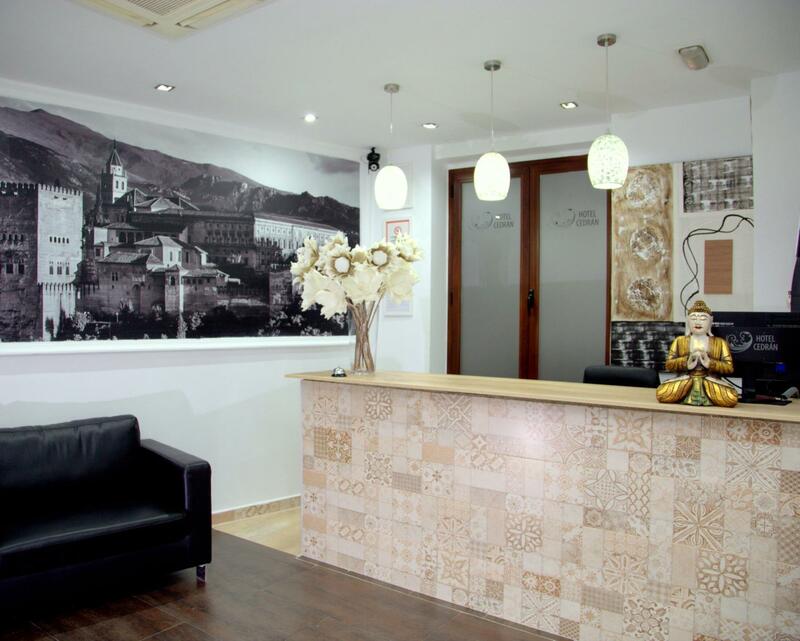 a great location in granada centre. loves my stay there except that the room is too cold maybe because of untight window or something, but the heater working fine. the other room my friends staying is ok. but i have to say the room is small compared to other hotels we live in at other cities with the same price. the staff is really nice and very informative. No está nada insonorizado, se escucha todo, el colchón es demasiado blando, no dejan que suban a visitarte ni un minuto, y con malas formas, parece una prisión. No me ha gustado nada. El Hotel esta muy bien ubicado, las instalaciones son aceptables, pero el personal y los servicios son pésimos. El primer día , empezó a caer agua del techo del baño ... y de muy mala gana el recepcionista nos cambio de habitación bufando y maldiciendo en voz baja..... Luego pedimos si podía darnos almohadas extra , nos las dio pero nos pregunto porque si eramos dos personas, para que las queríamos ? Las almohadas eran duras como piedra les pedimos si podía cambiarlas me dijo que eran las únicas que tenia !!! Le pedimos una toalla extra ya que mi esposa tiene el cabello largo y usa dos , de muy mala nos informo que solo dos toallas grandes y una pequeña. hubicación excelente para poder conocer toda la ciudad y disfrutar de sus múltiples encantos. La situación, la limpieza en parte y la seguridad. Decepcionante ya que había muchas cosas que no funcionaban y no cumplían las funciones acordadas. Fue buena, pero la habitación era demasiado pequeña y se escuchaba todo lo que sucedía en el hotel. Ascensor, escaleras, huéspedes de otras habitaciones....en fín, no puede descansar bien. 에어컨 잘 나오고 깨끗합니다. 위치가 큰 길에서 골목으로 살짝 들어간 곳이라 밤 늦은 시간에 숙소로 돌아가기에 좋았어요. 공항버스 정류장과 가까워서 아침 일찍 나와서 걸어갈 수 있었어요. 중심가와 살짝 떨어져있는 점은 아쉬웠지만 걷기 나쁘지 않았어요. 일단 그라나다에서 3번버스타고 내려서 맞은편에 있습니다. 하룻밤 자고 알함브라 볼거라 일부러 싼데 예약햇는데. 참... 하룻밤 손님이라 그런지 정말 안좋은방으로 주더군요... 근데 이방이 불이 안켜져서 손잡이가 박살난 방으로 줌 -_- 직원은 불친절 , 영어가 안됨 위치는 그럭저럭 좋은게 도보 7분이면 공항가는 버스탈수있습니다. 도보 12분이면 누에바 광장이 잇습니다. 누에바에 kebab king 여기 3유로에 맛있는 케밥 먹을수있습니다.